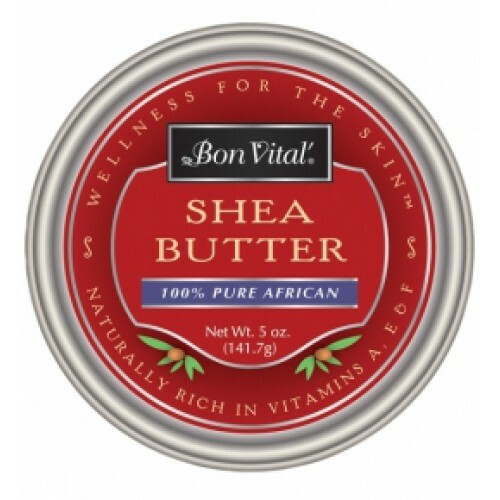 Shea Butter, by Bon Vital, is 100% natural, pure shea butter. This wonder ingredient is great for Skin Care applications. Shea Butter is known to reduce skin irritation, heal stretch marks, improve skin elasticity, moisturize, and even improve skin tone. The Organic Shea Butter acts as an Ointment, due to its pharmaceutical strength. 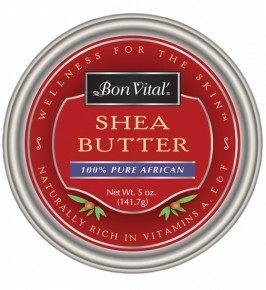 African Shea Butter deeply moisturizes and softens the skin. It is powerful enough to use on the body, but safe enough to use on the face and scalp. Sizes: 1.25 oz, 5 oz. When you have dry, working hands it takes quite a bit to prevent the skin from cracking. African Shea Butter keeps my hands really healthy. Shea butter is better for skin care than other other creams. It has so many natural qualities that benefit the skin. African Shea Butter is the best treatment I've seen for stretch marks. It's great stuff.